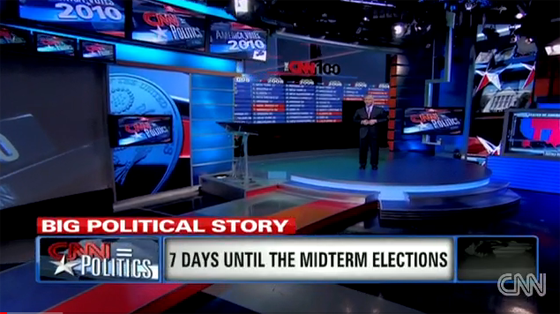 As the countdown to the 2010 midterm election continues, networks are stepping up their coverage with new gimmicks. This election, CNN has brought back the CNN Election Center and added the Election Matrix. While matrix may remind you of a movie, CNN’s matrix is far from it, appearing more as a gimmick with major bugs. Instead, it’s more a matrix of data presented graphically. 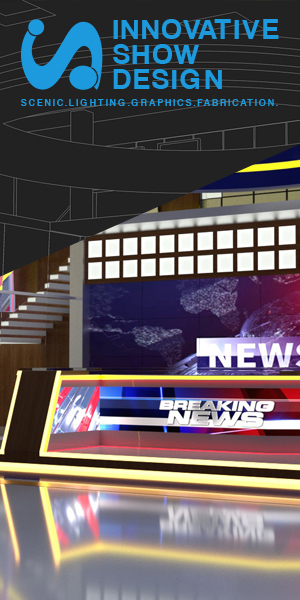 To do this, CNN is using virtual 3D real-time graphic technology, like we’ve covered here and here. 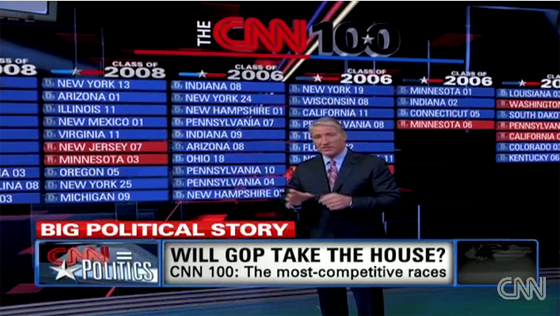 For its matrix, CNN has opted to use this technology to virtually add major races to an area they’ve dubbed “the matrix,” instead of using another monitor or RP screen to show them. While this may sound like a good idea, the idea has some major bugs. The technology of virtually placing real-time graphics into video has been around for a while with many sports broadcasts using it, such as the NBA on TNT. Inside a studio environment though, it appears the camera tracking is causing the graphics to twitch on air. This isn’t as noticeable on wide shots, but when tight shots of John King are shown, the graphics go nuts. Behind King appears to be a chroma key wall, based on the green reflection on the floor along with the way the graphic loop is added behind the matrix. This would allow them to add video with the real-time graphics layered on top. Hopefully CNN will resolve some of these issues before the big day, next week.